I was born and raised in Atlanta. Moved to Seattle area over 30 years ago where I have made my home ever since. I live in Mercer Island with my 2 dogs, 1 cat and 1 husband, all of whom are rescue. I love yoga and hula hooping. And I love our slice of heaven in France. I go as often as I can. We enjoy sharing it with others. Come rain or come shine…. I just returned home to the village today. It lifts me up to see it again. So beautiful. Although it has been in the 70’s this week, it is cool and grey at the moment which is not unusual for this time of year. 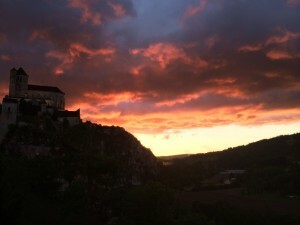 Although temperate from April through October, the weather in St. Cirq Lapopie is more variable at either end of the season. And with global climate change, the weather can vary significantly at any time. The good news is that the village and region are gorgeous rain or shine. 1) Visit the prehistoric caves at Pech Merle– arrange in advance on line for an English-speaking tour, or enjoy the odd and humorous translations on the hand-out sheet for the French-speaking tour. Or go spelunking with a guide from Kalapca in one of the many caves that sound in the region. Watch Cave of Forgotten Dreams before you go! 3) Take a day trip to Albi– a lovely city, the home of Toulouse-Lautrec, and with the most amazing cathedral this side of Chartres. Scary frescoes! 4) The outdoor markets run rain or shine– take your bag and your umbrella, and schedule yourself for a lunch break at one of the nearby cafes. There are markets nearly every day, all worth going to. 5) Watch a movie in the lounge upstairs—carry up some snacks and drinks and hang out. Click ‘pause’ once in a while and gather at the window for amazing views across the village and valley. 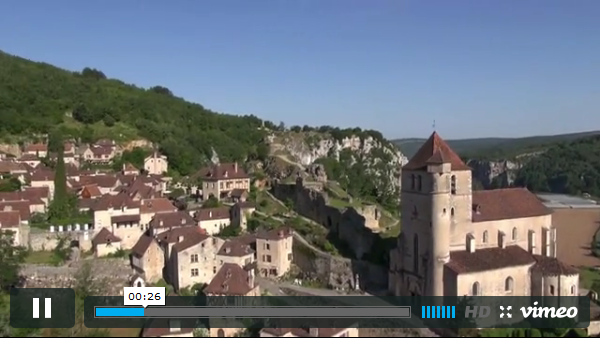 6) Drive to Conques or Cordes sur Ciel– or any of the other famously beautiful towns within less than a two hour drive. 7) Spend a few hours at a French spa or salon— there’s Alain at the Salon Siz-O in Limogne; and there are salons in Cahors. And just across our bridge is a lovely spa at the Hotel St. Cirq Lapopie. 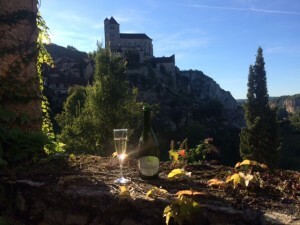 8) Take the wine tour of the great Wines of Cahors– the tourist office has a map for this– you can spend the day visiting half a dozen vineyards– bring a designated driver! 9) On a Thursday, make the drive to the morning market in Villefranche de Rouergue (leave early, you’ll need some time to find a parking place). The market is in the square, with lots of covered spaces to escape any drenching rain. Make a reservation at the Cote de Saveur restaurant just around the corner from the Chruch for a delicious lunch. You will NOT be diasppointed. 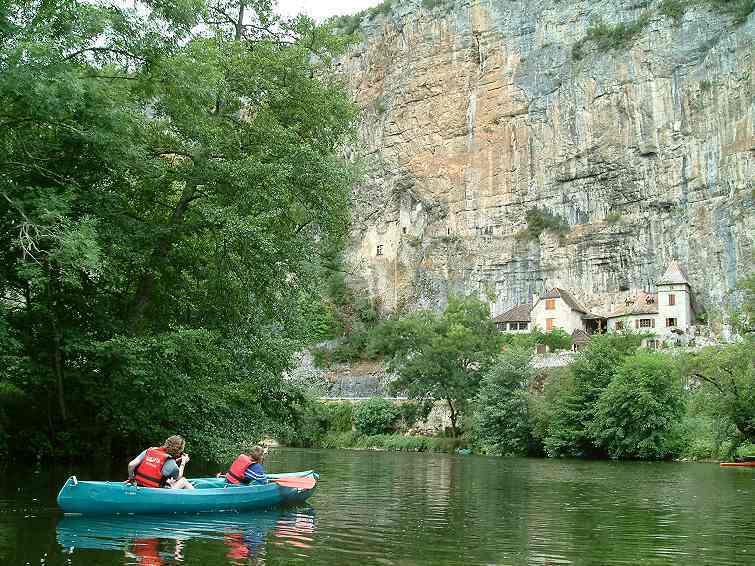 10) Walk the tow path by the river— use an umbrella until you get to the limestone overhang, which you will then walk beneath, temporarily free of drizzle. There is a beautiful Bas relief sculpture on the wall there. Cool! 11) Visit museums on subjects that may interest you– for instance, the Resistance Museum in Cahors. Or the Toulouse-Lautrec museum in Albi. 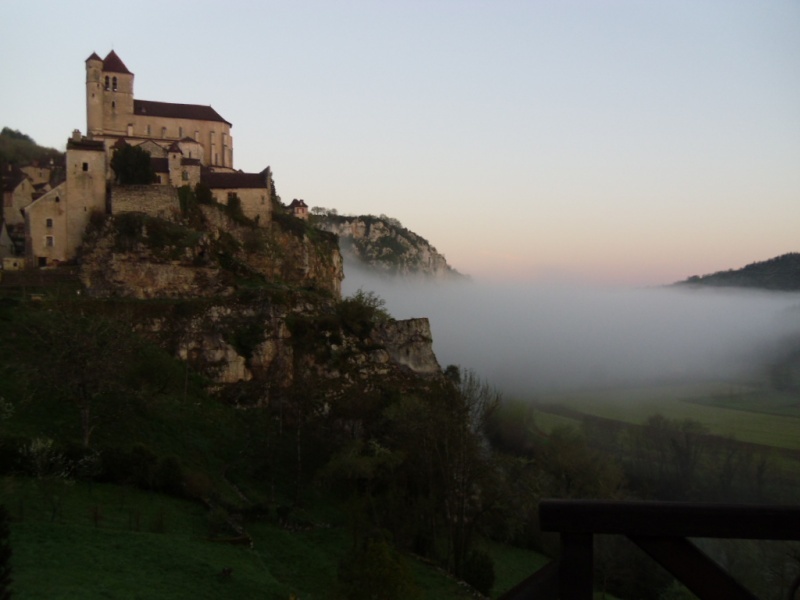 And there are two small and interesting historic museums in St. Cirq Lapopie! 12) Visit the excellent butcher shop in Limogne in the morning, then bring back food (if you aren’t already stocked up) and spend the day cooking gourmet meals, drinking wine, enjoying our beautiful home. 13) Do everything you’d do if it were sunny– just wear slickers, carry an umbrella, and bring a change of socks. This is just a partial list of things to do, but remember: you don’t even need to leave the village. The shops, the restaurants, the museums, the ruins, the vistas, the alleyways, the houses, all are there to explore. And you’ve got a great house to duck back into. Breathe deeply, relax, enjoy. My view outside my front door yesterday morning. It was visible for a minute then the mist quickly shrouded it fully again… Brigadoon! The weather in St Cirq can be very dramatic. Early in the morning there is often a fog that settles in the valley such that the church seems to arise from it, like Brigadoon. In an instant it is there. In the next, it is gone. After a storm, the birds sing in joy that the tempest is departed. Turn up the Volume and Listen to the Birds. The sunsets can vary from yellow, to orange, to red to purple to blue to black. All within ten minutes. Word must be getting around about our secret slice of heaven. 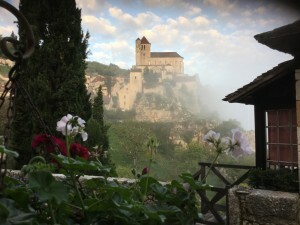 Yesterday two of my friends sent me this article by a travel writer who arrived at the foot of the village without any expectations. It reminded me of my first visit to St Cirq Lapopie in the 80’s. My sister and I started in Nice and drove north and west across the South of France. 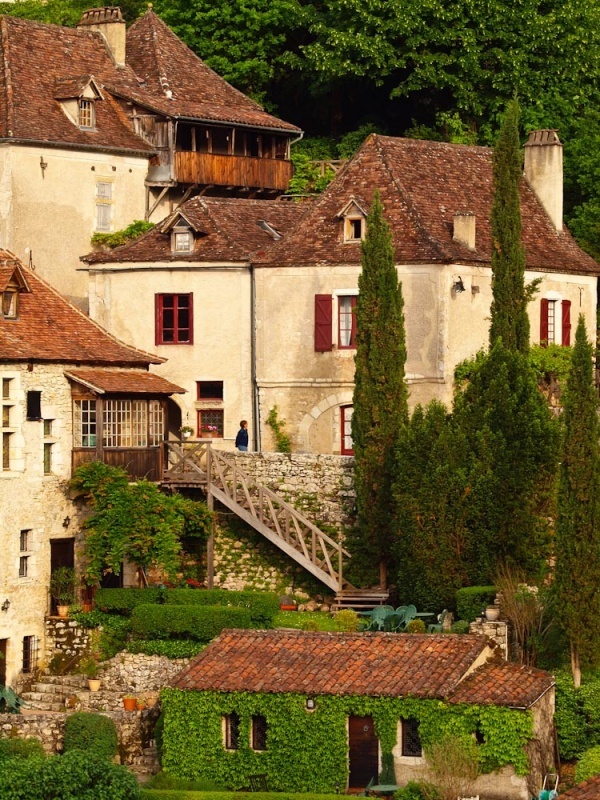 We explored sweet, undiscovered inns and scenic drives as described by Karen Brown in her book Charming Inns and Itineraries of France. We followed the “green” lines on Michelin maps, those roads marked as most scenic. We traveled through some of the most beautiful places I have ever seen: Gorge du Verdon (their Grand Canyon! ), Gorges du Tarn, Conques. The tiny village of St Cirq Lapopie was our last stop and as far west as we had time to drive in France. I will never forget winding up the hill and arriving at the most enchanting place I had ever seen. It was a September evening. We had the village to ourselves. And I was unable to stop inhaling. 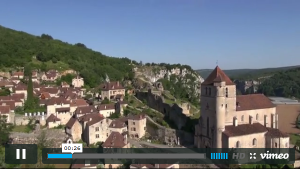 You can watch the video of St Cirq Lapopie below and read the blog about the most Beatiful Village in France yourself, if you like! ENJOY!!!! We’re replacing all the windows and doors in Maison d’Etre this year. 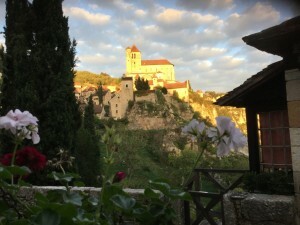 If you look at the photo, you can see that our house was two houses which are now one (connected by two hallways through thick stone walls). For that reason, the windows and doors are all different. Some have mullions, some do not. Some have shutters, some do not. Some work acceptably, some are falling apart. It was time for a face lift. When driving through villages and towns in rural France, I used to wonder why everything looked so empty, the buildings and homes were so shuttered, so closed up. I don’t know why it took me so long to figure it out. When I was growing up in the Southern US, in the days before airconditioning, I learned from my grandmother how everyone kept the house cool on hot summer days. In the morning, she would leave all the windows and doors open, allowing the cool morning air to enter the house. As soon as the temperature outside started to rise, my grandmother would close them all and pull the curtains. All day long, inside the house would remain relatively cool and comfortable, while outside would blister. In the evening, after it cooled off again, she would open all the doors and windows again, and the windows would remain open at night to allow for cool breezes while sleeping. In the next morning the cycle would repeat. We don’t have air conditioning in our home in Seattle. We do what Grandma did — with great success when it’s hot outside. Visitors on such days will comment that it is nice that we have air conditioning!. We don’t. We just close up the house. We also don’t have air conditioning in our house in France. Maison d’Etre is actually made of local materials — mostly limestone rock, which is very porous. The house is located beneath a causse (a hill with plateau). Water naturally drains down the through the hill, through the stones and into the River Lot. This flow of water through limestone is what has created the ages old caves that were used by people as early dwellings and where they created the famous painted walls inside. So our house is something like a giant “swamp cooler” — another Southern invention which involves any device (even a wet sheet or towel over a door!) that cools through the evaporation of water. If you keep the doors and windows closed in our house in France, the house can stay cool on hot days. What I didn’t realize until I lived there is that the shutters on the outside of the house work just like Grandma’s curtains. They make the whole system work even better. The next time you are in France, driving through a town that looks closed up, just remember it is shuttered down, not shut down. The French are inside, eating a wonderful lunch and relaxing in a cool room. 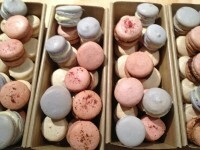 And remember, when you are at Maison d’Etre, close up the shutters for the day while you are out. You will return to a much more comfortable home!